This courante (or, to follow the Italian spelling used by Bach, “Corrente”) constitutes the second movement of the famous Partita in A minor for solo flute. It is a courante of the livelier Italian-derived variety, relatively quick-tempoed and in simple triple meter. Also true to tradition are the asymmetrical dimensions of the movement's two “halves”: twenty-two bars, forty-one bars. 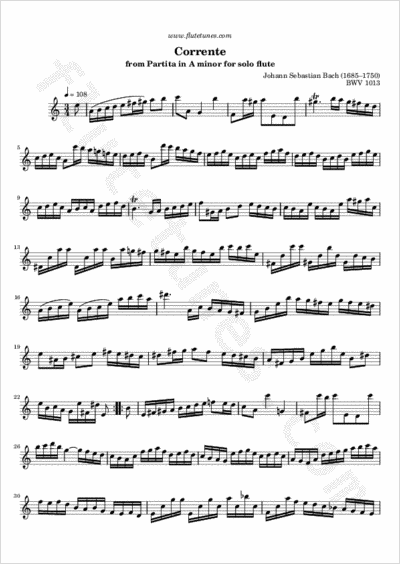 Truly striking is the unexpected high D-sharp that the flute hollers out near the end of the first part and then leaves without ever resolving in the same register, forcing us to be content with an E-natural in the octave below.